86. 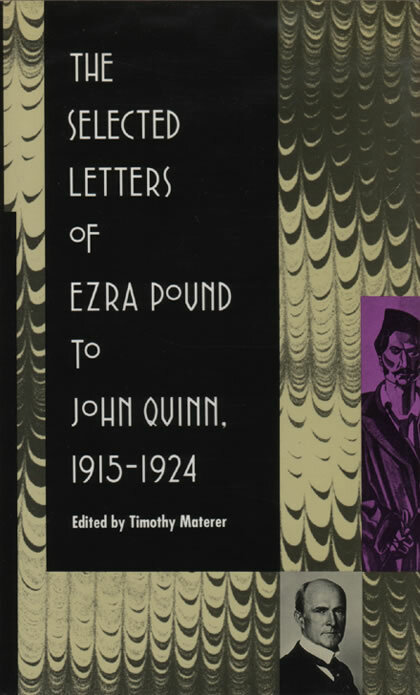 The Selected Letters of Ezra Pound to John Quinn, 1915-1924. Edited by Timothy Materer. Durham: Duke UP, 1991. Among many instances of the support the lawyer and patron of the arts Quinn provided for Pound and other writers, most notably Yeats (see BL48e and g-i), may be cited his subsidies for the publication of ‘Noh’ (24) and the American edition of Lustra (see 20), along with several periodicals with which Pound was associated, including the Egoist and Little Review. In addition to letters noted others printed here refer to “Noh’, Cathay (15), Fenollosa, and Pound’s relation with Aldington, Binyon, Bynner, Eliot, Fletcher, Flint, Lowell, and Waley (see index). Reprints Pound’s letter to Quinn of 10 January 1917 (59e), and see also e below. a. 8-9 September 1916 . By late in 1915 Pound and Quinn were corresponding about the possibility of founding a journal that would represent the best of international literary and artistic standards. In this letter Pound suggests editors for monthly sections devoted to work from France, Britain, Germany, and Russia, and recommends bi-monthly or annual reports on works from other countries, including Japan, though he has some question about this: ‘re/ Japan. Itow [Itôm Ap] brought in what he swears to be the best modern Japanese dramatist (I should think he was their precious Granville Barker, Takahama Kori [i.e. Kayano, also known as Kôri Torahiko], and he swore by the gods that there was NOTHING doing in Tokyo, said the theatres were full of translations of Strindberg, Maeterlinck, Hauptmann etc. etc. all done with the last degree of rottenness’ (bracketed material added, spelling and punctuation as printed). b. 19 August 1916. Pound has given Itô a letter of introduction to Quinn and explains his own friendship with Itô and what Quinn might expect, ‘if [he] can understand [Itô’s] english’: ‘I like him better than Coomaraswamy. In fact I like him a good deal, though I don’t know that he has much conversation unless one can start him on Japanese plays etc’. c. 19 April 1917. In describing his bank account to Quinn Pound notes that it contains ‘£6 belonging to the committee on the production of Japani-Celtic-mask-dancing-Ainley-Itow [Itô]-Hawkwsel [At the Hawk’s Well (BL12)] drama’; he notes also that Yale University Press has written to him asking to see a full manuscript of his ‘NOH’ (see 24). d. 17 May 1917. Toward the end of this long letter Pound describes the circumstances of his acquisition of the Fenollosa manuscripts from Mary Fenollosa: ‘She has given me absolutely free hand with old Fen’s stuff. Which I think rather remarkable as she writes herself (successful novels . . . and verses also . . . ). All she said was, after she had known me about three weeks, “You are the only person who can finish this stuff and [as] Ernest would have wanted it done. He cared about the poetry not about the philology”’. Pound recalled Mary Fenollosa’s words in nearly identical terms forty-four years later in conversation with Bridson (see 67). e. 3 April 1918. Pound wrote to Quinn on 3 April and 4 June 1918. Both letters appear both in this work and in the earlier edition of Pound’s Letters (59), but a passage about the ‘softness’ of the nô printed in the earlier work as part of the letter of 4 June (see 59f) appears here as part of the letter of 3 April.